Trolling heavy gear like Dipsy Divers, lead core and copper line make no sense when targeting spring coho and browns. Downsizing gear is the way to make spring fishing exciting again. I’m guilty of getting a little crazy about the time ice starts melting from boat launches all across the Great Lakes. After being cooped up doing fishing seminars and boat shows for three straight months, those first couple of open water fishing opportunities are extra sweet. I call it going “coho crazy” because coho salmon are typically the first species open water trollers can target here in the Great Lakes region. Not only are coho popular on the table, when you find a school it’s common to hook up with two or three at a time! Very few other species of fish are as active as spring coho. The problem with these fish is they are long on taste and short on stature. 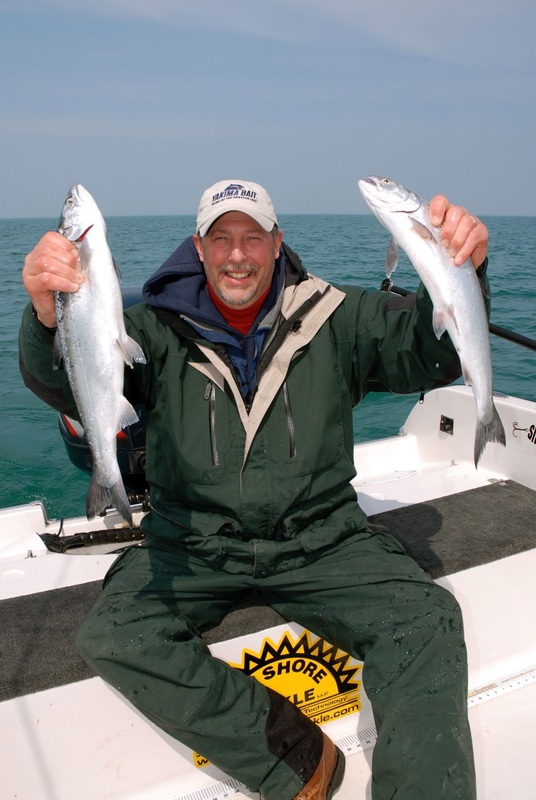 The typical coho caught in Great Lakes waters during March, April and even into May average about two pounds in size. Most captains who target spring coho are fishing them with the same gear and presentations they use to catch salmon the rest of the year. Downriggers, diving planers and lead core line teamed up with planer boards are the most common presentations. Here’s where I stray from the crowd. Catching a two pound coho using a standard Dipsy set up is like going bluegill fishing with my musky rods. Coho are exciting fish to catch when they are targeted using lighter rods, reels and line diameters. Since most anglers can’t justify owning multiple sets of trolling rods, I clearly understand why they use their heavy salmon gear to also target spring coho. Many years ago I started using my walleye trolling sticks for targeting spring coho and browns. This simple step instantly put the fun back into spring trolling. A 20 size line counter reel loaded with 10 to 12 pound test monofilament is the perfect set up for coho, browns and of course walleye. The next step is downsizing the terminal tackle to match with the lighter rods and reels. Across the Great Lakes anglers commonly target coho using two attractors including dodgers and rotators. Both of these attractor types create a lot of unnecessary resistance in the water. An alternative is the Big Al Fish Flash a triangle shaped flasher that spins on it’s own axis creating lots of flash and near zero drag in the water. The Fishing 411 guys use the four inch Fish Flash a ton when targeting coho with small spoons like the Mini Streak by Wolverine Tackle. Fish Flash works great on a light or medium light downrigger rod when attached directly to the snap on the end of the rod. Next add a fluorocarbon leader five to six feet in length and then the spoon of choice. Coho in the spring are typically modest in size. downsizing rods, reels, lines and lures. Wobbling plugs are especially deadly on coho and brown trout. Wobblers have their own “Dive Curve” which means they dive below the surface at increasing levels based on how far behind the boat they are trolled and also the line diameter used in trolling. 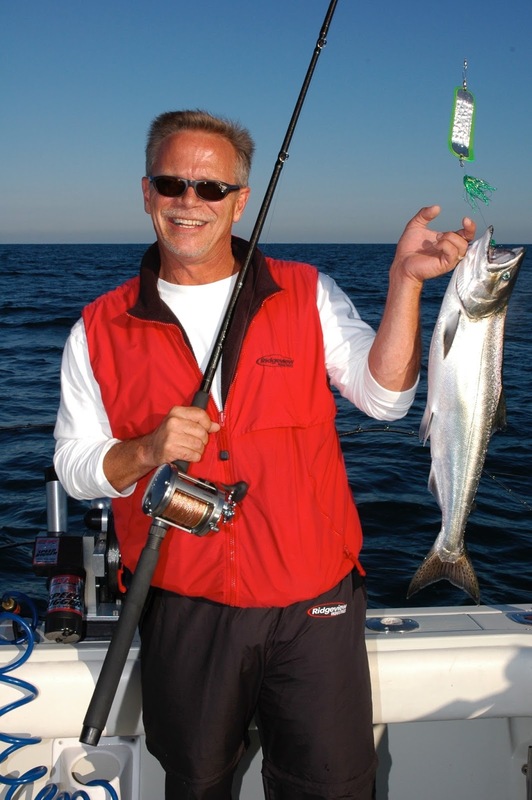 The best “wobblers” for coho tend to be compact baits with a wide wobble and noisy rattles. The Yakima Mag Lip in the 3.0 and 3.5 sizes is an ideal wobble bait for targeting spring trout and salmon. Other good baits include the Yakima Fat Wiggler, Storm Wiggle Wart and Hot n Tot series of hard baits. For coho these baits produce best when fished suspended in the water column. For brown trout it helps to fish these baits a little deeper and to make occasional contact with bottom. In-line boards like the popular Off Shore Tackle Side-Planer are essential tools for spreading out plug lines to cover the maximum amount of water. Stacking boards two or three per side is the best way to cover the maximum amount of water, but this also requires rigging the boards accordingly so they can be released when fish are hooked. 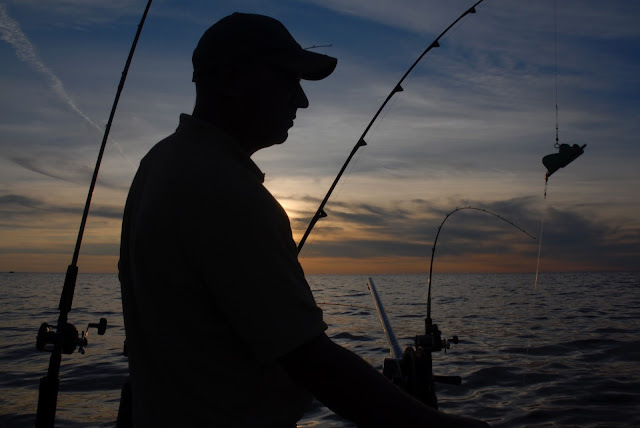 Most in-line boards are designed to stay on the line, forcing the angler to fight both the fish and the board as it tries to plane to the side. The Side-Planer is different in that this board comes with an OR19 (orange) line release on the tow arm of the board and also an OR16 (red) Snap Weight Clip mounted at the back of the board. Rigged in this manner the line can be tripped from the tow arm release when a fish is hooked simply by giving the rod tip a little snap. This trips the line from the release and allows the board to spin around backwards. The board remains affixed to the line because the OR16 Snap Weight Clip has a plastic pin between the rubber pads that insures the line can not come out of the clip. When a fish is hooked and the board tripped, the fish immediately starts to drag the board to the back of the boat. The tripped board slides right past other board lines making it unnecessary to clear lines while fighting fish. The trick to this set up is to be patient and reel slowly on a hooked fish at first. This gives the board time to slide out of formation and clear other planer board lines. Once the board is directly behind the boat, reel in the board and fish together. When the board is close enough to the boat, grab the board and remove it from the line. The final step is to simply fight the fish to net. the whole purpose of “sport fishing” in the process. Some manufacturers recommend releasing their boards and letting the board slide down the line to the fish. Normally a bead or swivel is used to stop the board from sliding all the way to the fish. This method sounds good in theory, but forces the angler to fight a fish that can easily pull the board under water. Once the board submerges, the fish gains considerable leverage off the board and often tears free before it can be landed. At the very least trying to land a fish and submerged planer board destroys any chance of enjoying the fight. In the spring time downsizing from traditional salmon gear to “walleye gear” puts the sizzle back into spring trolling for coho and browns.